Taking them one by one shows that, though the AfD risk is real, the electorate remains by far in favor of Merkel’s moderate approach to governance. 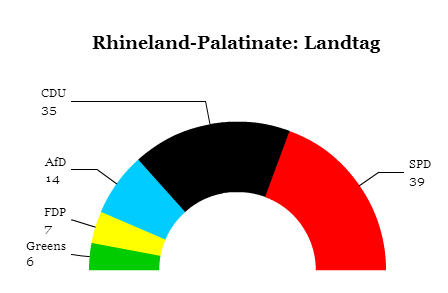 Rhineland-Palatinate, a southwestern state of arou nd 4 million people, borders Belgium, northern France and Luxembourg. For three decades, it has been an SPD stronghold, and it’s an export-heavy state that produces some of the best German wines, and it’s home to a lot of manufacturing of everything from glass products to automobile products. Here, SPD leader Malu Dreyer held off the CDU and, while the AfD won 12.6% of the vote, the SPD and CDU together won 68% of the vote. That’s hardly an upending of the status quo, considering both are part of the national government. 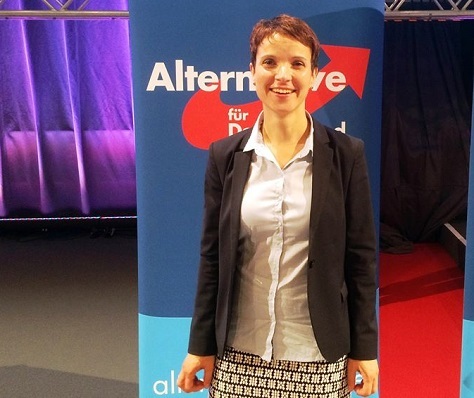 Notably, the center-right, liberal Freie Demokratische Partei (FDP, Free Democratic Party), Merkel’s coalition partner between 2009 and 2013, returned to the Landtag after losing all of its seats in the prior election. 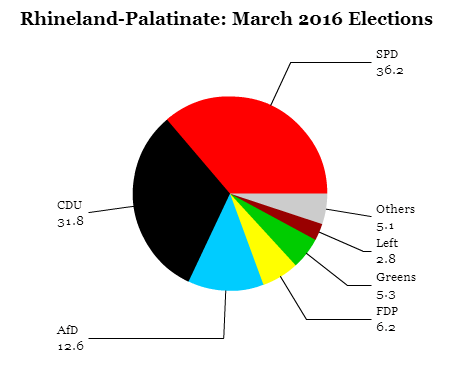 The FDP’s success in Rhineland-Palatinate and in Baden-Württemberg is a sign that they could return to the Bundestag in the 2017 elections. Baden-Württemberg, by far the largest prize with 10.6 million voters, has the lowest unemployment rate in Germany (4.0%), and it’s home to Daimler, Porsche and software manufacturer SAP. 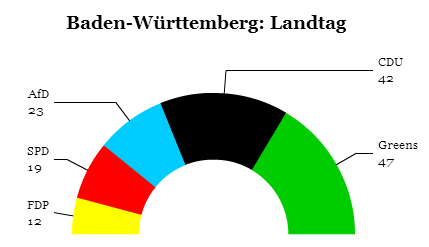 Here, for the first time in postwar history, the CDU didn’t finish the election as the top-ranked party, falling behind the Die Grünen (The Greens) of the wildly popular incumbent minister-president, Winfried Kretschmann, whose stand on migration was far more in line with Merkel’s approach than the approach of the CDU’s state-level leader. 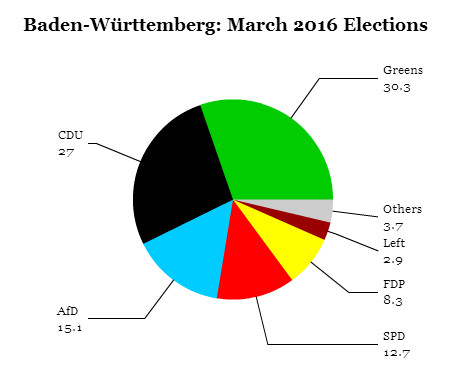 The SPD fell behind the AfD to fourth place, though that had as much to do with the Green surge as with the AfD’s support. That means that Kretschmann may have to look to the FDP or even the CDU for a new majority, But together, the three parties and the FDP won over 78%, a resounding vote for mainstream parties. 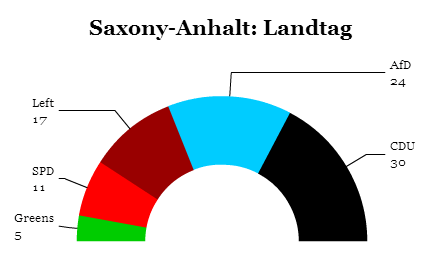 The AfD’s best result came in Saxony-Anhalt, the sole eastern state to vote in Sunday’s elections. Though it was expected to win up to 18% of the vote, its 24% support was far beyond what anyone expected, and well within single digits of the CDU, which governs in a grand coalition with the SPD. 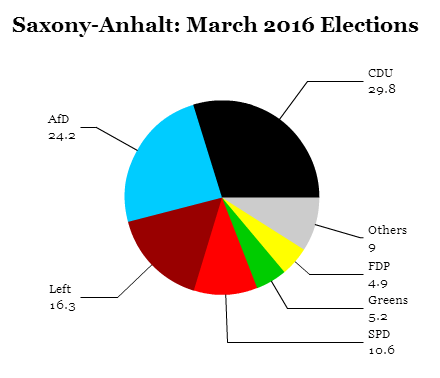 The CDU will now have to look to the Greens as well as the SPD for majority support. But though the AfD’s rise in the east is perhaps much more alarming, it’s due less to poaching the CDU’s traditional conservative voters and instead from stealing votes from the left-wing electorate. The swing away from the CDU was just 2.7%, but the swing away from the SPD was 10.9% and from the more radical Linke 7.4%. Though it has a small population, just 2.2 million, Saxony-Anhalt has one of the highest unemployment rates in the country. It’s a not-subtle reminder that the SPD, locked into a national coalition with Merkel and sharing much of the same economic policy, migration policy and EU policy, faces perhaps a greater crisis in the years ahead, as it struggles to articulate a cohesive center-left alternative to Merkel’s consensus approach.